Each year Mother’s Day brings upon me mixed emotions, I feel much gratitude and joy for my amazing mother and grandmother who have helped to shape me into the woman I am today. At the same time I am also gripped with the sense of loss and emptiness as I recall the babies I have never been able to hold, but only carried for a short time. There are so many women who are walking around today holding within them a secret that may have only been revealed to their husband or closest family member. It is a secret that many women never talk about. The whole experience remains hidden not knowing how to process their feelings and unsure of how others may react, they go on as if nothing happened. The reality is something did. They say it’s better to have loved and lost than never loved at all, but after miscarrying for the second time I questioned if this was true. The emptiness and hurt that clenched my heart now for a second time, the anger and loneliness that fell upon me left me wishing it all would have never happened. I began to think that maybe it would have been best if I never would have conceived than I wouldn’t be grieving over the loss of my baby and feeling this pain. I wouldn’t have to go through the next few months acting like everything was okay as if nothing ever happened. With further reflection upon this I realized that if this was true I also would have missed the joy and the excitement that comes from finding you are pregnant. The instant bond and hope only a mother knows. I would have never known the love that is felt so deeply for the child in your womb. With the help of God’s grace, prayer and time I was able to let go and trust. When I found out I was pregnant for the third time I was in a different place. I was just grateful for this new life, new soul, and new creation of God. Every morning I would thank God for the child in my womb and pray in thanksgiving for the gift of one more day to have with my baby. Seven weeks in I found out again that this was a baby I would never meet. Although I was filled with grief, I had to continue to thank God and referred to Job 1:21, “The LORD gave and the LORD has taken away; blessed be the name of the LORD!” It may have been hard to see at the time, but all is a gift! We are all on loan from God and He decides when to draw His children back to His loving heart. In recognizing the dignity of your child I encourage you to name the baby you have lost and do something special in memory of them. Remember the date they passed on from this life even with something as small as a bouquet of flowers on your kitchen table. If possible collect and bury the remains. There are ministries out there that provide burial vessels for these tiny souls. Talk to a priest or a deacon and ask for the “Blessing of Parents after a Miscarriage.” Acknowledge and be grateful for the beautiful baby you have been blessed with, however short the time. This was your child and not merely tissue or the product of conception. I am touched by the thoughtfulness of my husband who always gets me flowers on Mother’s Day and the occasional family member who will wish me a “Happy Mother’s Day.” My motherhood continues to remain hidden, but I am blessed to have carried those three precious babies. I may not have them with me physically, but they are my intercessors in heaven whom I call upon frequently and God willing I will meet them some day in eternity. Although there may be times when it seems as if no one understands or feels your pain, turn to Mary she does…for she lost a child once too. Amen! The last comment was so beautiful and insightful. Your words came through the Holy Spirit and will help many including me. Thank you. God bless you and our little Angels in Heaven. Hi, thank you for your humble sincerity. I am touched by your serenity and am sure you’ve tried multiple avenues to conceive. Seeing your sonogram reminded me of our journey. We were blessed as well with a little girl after using the Creighton Model and NaPro technology…beautiful gifts of the rich, Catholic faith. We continue our journey through another period of infertility. God bless your journey and thank you, once again, for your serenity in how God is calling you and your motherhood…biologically /spiritually. That’s where we are now. 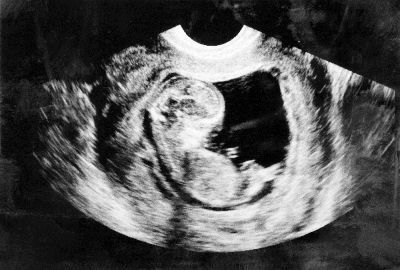 Thank you for your kind words, I am sorry to hear you are going through another period of infertility. NaPro Technology is truly a gift and has amazing success rate, we were blessed to be able to work with Dr. Hilgers multiple times.